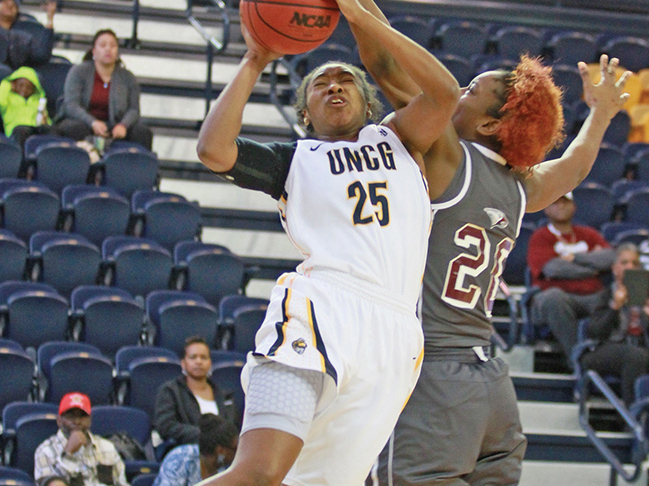 The UNCG women’s basketball team came one point shy of matching a program record for points scored in a game during the Division I era with a 103-56 win over North Carolina Central (1-10, 1-1 MEAC) in a New Year’s Eve matinee Thursday afternoon. The Spartans improve their win-streak to three games and finish the non-conference season with a winning record, 8-7, for the first time since the 2000-01 season. The team-high record 103 points wasn’t the only mark UNCG made in the history books though, the Spartans shot an impressive 66.1 percent from the field (41-for-62) to set a single-game Division I era (Since 1991) record. The 47-point margin also ranks third best in program history. UNCG jumped out to an early 13-0 lead as the Eagles shot 0-for-9 on their first attempts. It all began seconds into the game when Bailey Williams drained a three-pointer for the opening basket. At 5:06, NCCU got on the board with a layup by Tisha Dixon, who led the Eagles with a team-best 18 points in the loss. UNCG never looked back and ran off to lead 27-11 in the first quarter. The Spartans carried their tempo into the second quarter outscoring North Carolina Central 24-10 to lead by 30, 51-21, at halftime. UNCG scored 16 points in the paint in the third quarter and outscored North Carolina Central 29-17. The Spartans entered the final frame with a 42-point lead. The two teams exchanged baskets down the stretch, as the Eagles were unable to chip away at the deficit. UNCG took its largest lead, 47, with under a minute to play and held on for a 46-point win.